This Smoked Salmon Breakfast Bagel recipe is the best breakfast bagel sandwich EVER! 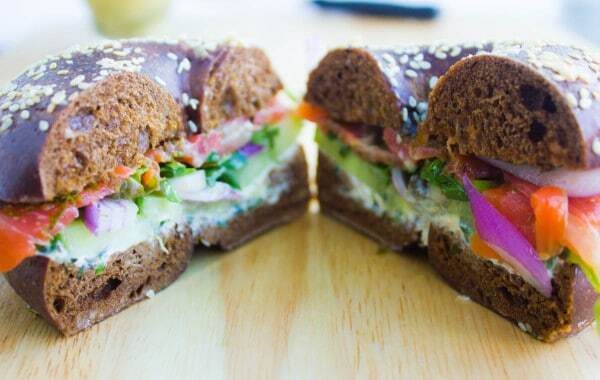 With simple yet flavorful bagel fillings like herb cream cheese, smoked salmon and a final drizzle of sweet dill sauce, this healthy pumpernickel bagel will be your new go-to! This Smoked Salmon Breakfast Bagel recipe is one of my favorite breakfasts! It’s simple, yet perfect with just the right amount of filling! 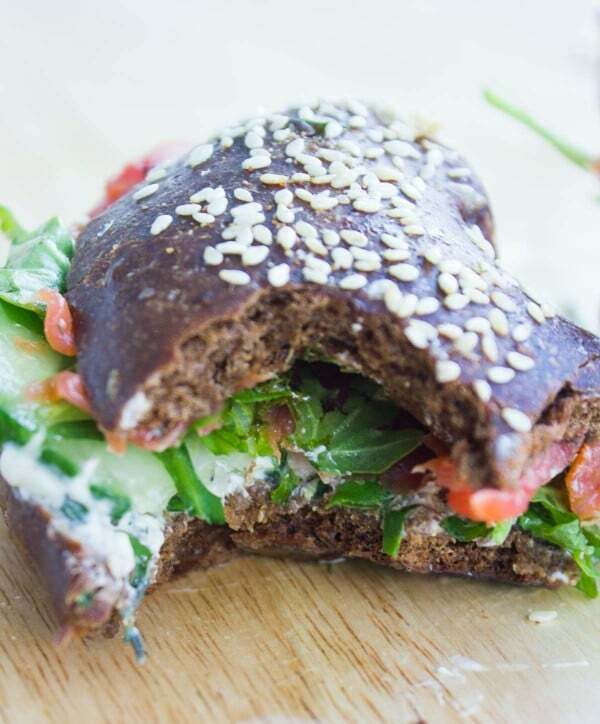 Picture a healthy Pumpernickel bagel with easy yet elegant bagel fillings like herb cream cheese, smoked salmon, and a final drizzle of a sweet dill sauce! Breakfast Bagel Perfection! If you’ve missed this ultimate easy smoked salmon platter recipe for any reason—here’s a chance to catch up! It’s one of my favorite ways to throw breakfast/brunch/lunch for a crowd in minutes with a really rustic homey feel. This Smoked Salmon Breakfast Bagel is just a fancier way of putting the platter together in bagel breakfast sandwich! It’s classic, timeless, but also special with that little drizzle of Sweet Dill Sauce! A breakfast bagel sandwich your whole family will LOVE! There are so many ways you can jazz up your smoked salmon breakfast bagel and so many additions you can choose from! I will make this breakfast bagel recipe brief and not go on forever. Obviously, these homemade Smokes Salmon Breakfast Bagels are so much better than anything you can buy at a coffee shop or bistro because here you can add as many toppings and as much Mustard Dill Sauce as you like! I start with this homemade garlic lemon herb cream cheese, which I highly recommend, even though store-bought herb cream cheese would work just as well as a bagel spread. Now on to the sweet mustard dill sauce—this sweet sauce works like magic with smoked salmon! It’s the perfect sweetness, tang and dill-y accent. It only takes 3 minutes to whip up and keeps in the fridge for weeks! If you’ve got extra, use them on your summer salads—it’s just a yummy dressing! 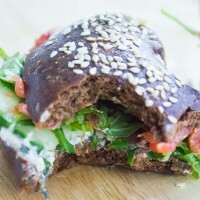 My favorite type of bagel is pumpernickel and that’s what I use here in this Smoked Salmon Breakfast Bagel. My bagel fillings are cucumbers, red onions, arugula, sliced apples, and thinly sliced avocados. These toppings are a perfect contrast of sweet, salty, crunchy, fresh, tangy and silky smooth. Paired with a sweet, healthy toasted Pumpernickel – simply divine! Next time you’re rushed to serve brunch/lunch for a crowd, pull up some of these easy breakfast bagels and you’ll never go back to the coffee shop version! I just narrowed the bagel fillings down to my favorites. Feel free to add plenty of your favorites too and make this bagel unique every time. 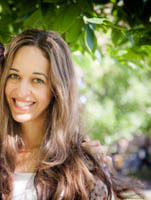 Obviously, the fillings work on any regular sandwich, especially when choosing dark rye or pumpernickel. This Smoked Salmon Breakfast Bagel recipe is the best breakfast bagel sandwich EVER! 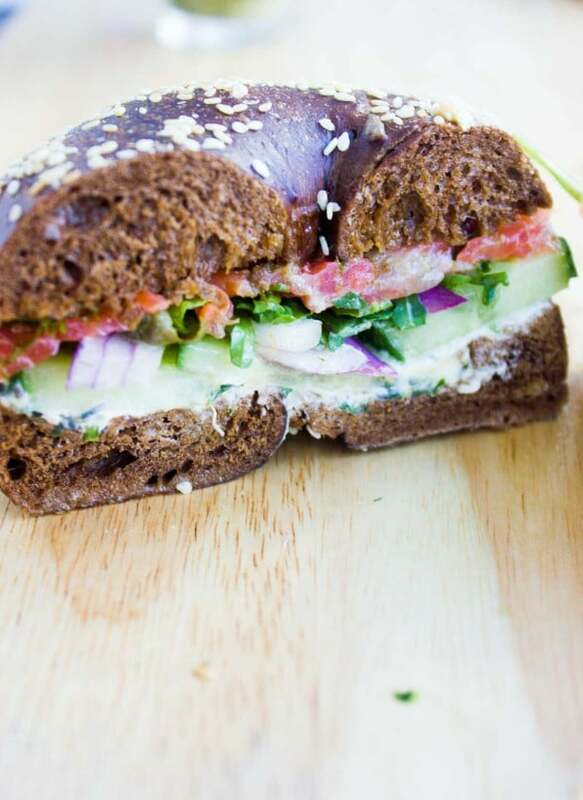 With simple yet flavorful bagel fillings like herb cream cheese, smoked salmon and a final drizzle of sweet dill sauce this healthy pumpernickel bagel will be your new go-to! Slice each bagel in half and toast it to your desired crunchiness. Spread a little less than a tablespoon of garlic herb cream cheese on each bagel half (more or less to your taste). 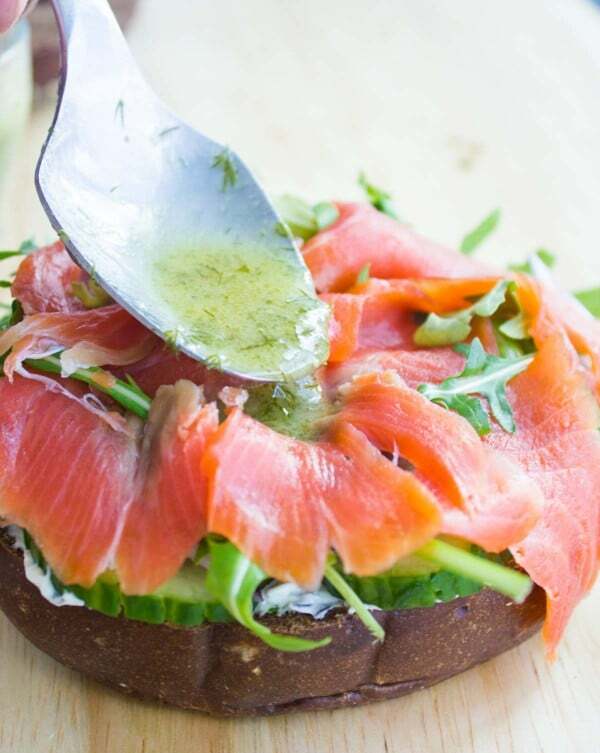 On one half of each bagel, start layering the smoked salmon, toppings, arugula, cucumbers, onions, apples and avocados. Drizzle a little less than a tablespoon of sweet mustard dill sauce on top of the toppings (more or less to your taste). Place the other bagel half on top and serve.